Ibrahim (/ˌɪbrəˈhiːm/; Ottoman Turkish: ابراهيم‎; Turkish: İbrahim; 5 November 1615 – 18 August 1648) was the Sultan of the Ottoman Empire from 1640 until 1648. He was born in Istanbul the son of Ahmed I by Valide Kösem Sultan, an ethnic Greek originally named Anastasia. He was later called Ibrahim the Mad by 20th-century historians due to his reputed mental condition. Ibrahim was born on 5 November 1615, the son of Sultan Ahmed I and his favorite concubine who later became his legal wife, Kösem Sultan. When Ibrahim was 2, his father suddenly died, and Ibrahim's uncle Mustafa I became the new sultan. By that time, Kosem Sultan and her children, including young Ibrahim had been sent to the Old Palace. After the succession of his brother Murad IV, Ibrahim was confined in the Kafes, which affected his health. Ibrahim's other brothers Şehzade Bayezid, Şehzade Suleiman and Şehzade Kasım had been executed by the order of Sultan Murad IV, and because of that Ibrahim feared that he was next in the line. However, after his brother's death, Ibrahim became the Sultan of the Ottoman Empire. 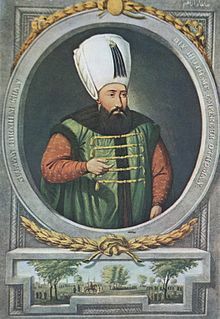 One of the most notorious Ottoman Sultans, Ibrahim spent all of his early life in the close confinement of the Kafes before succeeding his brother Murad IV (1623–40) in 1640. Three of his brothers had been executed by Murad, and Ibrahim lived in terror of being the next to die. His life was only saved by the intercession of Kösem Sultan, mother of Ibrahim and Murad. Kara Mustafa Pasha remained as Grand Vizier during the first four years of Ibrahim’s reign, keeping the Empire stable. With the treaty of Szön (15 March 1642) he renewed peace with Austria and during the same year recovered Azov from the Cossacks. Kara Mustafa also stabilized the currency with coinage reform, sought to stabilize the economy with a new land-survey, reduced the number of Janissaries, removed non-contributing members from the state payrolls, and curbed the power of disobedient provincial governors. During these years, Ibrahim showed concern with properly ruling the empire, as shown in his handwritten communications with the Grand Vizier. Kara Mustafa in turn wrote a memo on public affairs to coach his inexperienced master. Ibrahim’s replies to Kara Mustafa's reports show he had actually received a good education. Ibrahim often traveled in disguise, inspecting the markets of Istanbul and ordering the Grand Vizier to correct any problems he observed. Ibrahim came under the influence of favorite harem ladies such as mistress of the imperial harem Şekerpare Hatun and the charlatan Djindji Khodja, who pretended to cure the Sultan's physical ailments. The latter, along with his allies Silahdar Yusuf Agha and Sultanzade Mehmed Pasha, enriched themselves with bribes and eventually usurped enough power to secure the execution of Grand Vizier Ḳara Muṣṭafā. Djindji Khodja became Kadiasker (High Judge) of Anatolia, Yusuf Agha was made Kapudan Pasha (Grand Admiral) and Sultanzade Mehmed became Grand Vizier. Ibrahim's six-year-old son Meḥmed was made Sultan. The new Grand Vizier, Ṣofu Meḥmed Pasha, petitioned the Sheikh ul-Islam for a fatwā sanctioning Ibrahim's execution. It was granted, with the message "if there are two Caliphs, kill one of them." Kösem also gave her consent. Two executioners were sent for; one being the chief executioner who served under Ibrahim. As officials watched from a palace window, Ibrahim was strangled on 18 August 1648. His became the second regicide in the history of the Ottoman Empire. Şehzade Orhan (October 1648 – January 1650) – with Hümaşah Sultan. In the Turkish series, Muhteşem Yüzyıl: Kösem he is portrayed by actor Ridvan Aybars Duzey as a prince and by Tugay Mercan as a Sultan. ^ Baysun, M. Cavid (2012). Kösem Wālide or Kösem Sulṭān. Encyclopaedia of Islam, Second Edition. Brill Online. Retrieved 10 July 2012. ^ Gökbilgin, M. Tayyib (2012). Ibrāhīm. Encyclopaedia of Islam, Second Edition. Brill Online. Retrieved 10 July 2012. ^ Börekçi, Günhan. "Ibrahim I." Encyclopedia of the Ottoman Empire. Ed. Gábor Ágoston and Bruce Masters. New York: Facts on File, 2009. p.263. ^ a b c d Gökbilgin, "Ibrāhīm." ^ a b Baysun, "Kösem Wālide or Kösem Sulṭān"
^ a b Börekçi, p.263. ^ Quioted in Thys-Senocak, p.26. ^ Thys-Şenocak, Lucienne (2006). Ottoman Women Builders: The Architectural Patronage of Hadice Turhan Sultan. Ashgate. p. 89. ISBN 978-0-754-63310-5. ^ Resimli tarih mecmuasi. Iskit Yayinevi. 1956. p. 229. ^ a b Çelebi, Evliya; Erkılıç, Süleyman Cafer (1954). Turk Klasikleri, Issue 34. p. 62. ^ a b c d e f g Mustafa Çağatay Uluçay (2011). Padişahların kadınları ve kızları. Ankara, Ötüken. pp. 56–61. ^ a b c d Mustafa Çağatay Uluçay (2011). Padişahların kadınları ve kızları. Ankara, Ötüken. pp. 63–65. ^ a b c Sakaoğlu, Necdet (2008). Bu mülkün kadın sultanları: Vâlide sultanlar, hâtunlar, hasekiler, kadınefendiler, sultanefendiler. Oğlak Yayıncılık. pp. 260–262. ^ a b c Silahdar Findiklili Mehmed Agha (2012). ZEYL-İ FEZLEKE (1065-22 Ca.1106 / 1654-7 Şubat 1695). pp. 1290, 1400, 1580. ^ Silahdar Findiklili Mehmed Agha (2001). Nusretnâme: Tahlil ve Metin (1106-1133/1695-1721). p. 461. ^ Cite error: The named reference Mustafa Uluçay2 was invoked but never defined (see the help page). ^ Cite error: The named reference Necdet Sakaoğlu2 was invoked but never defined (see the help page). ^ Cite error: The named reference Mustafa Uluçay4 was invoked but never defined (see the help page). ^ Cite error: The named reference Necdet Sakaoğlu4 was invoked but never defined (see the help page). ^ Cite error: The named reference Mustafa Uluçay3 was invoked but never defined (see the help page). ^ Cite error: The named reference Necdet Sakaoğlu3 was invoked but never defined (see the help page). This page was last edited on 12 April 2019, at 14:04 (UTC).